- Thoreau in his Journals. 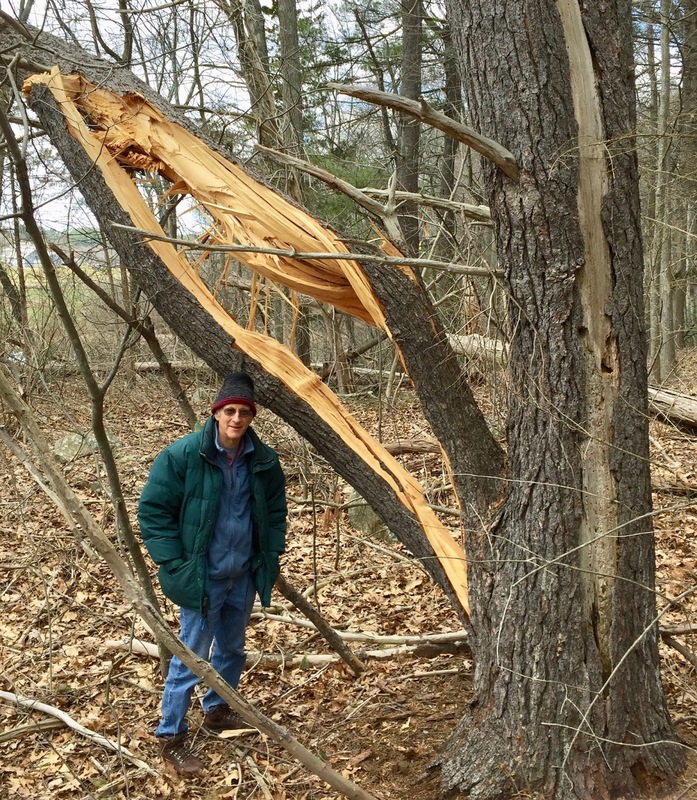 Trees in the Boston area took a tremendous beating during the March’s Nor’easter storms that combined strong winds and wet snow. Many trees toppled over and the trunks of other trees snapped, leaving whole trees on the ground. Trees blocked roads, damaged buildings, and pulled down power lines. In addition, branches, large and small, broke from standing trees and created woody tangles on the ground. At times like these, trees seem like an annoyance, and we forget the many benefits that they provide us, such as shade, windbreaks, and wildlife habitat. While most of the woody debris has now been cleared away, evidence of the storm is readily apparent in the fresh scars on tree trunks where branches broke off, and in the cracked and broken branches remaining in the treetops. In the forests, piles of branches and trunks remain on the ground creating a danger of summer forest fires. According to climate change models, New England will have more frequent nor’easter storms in coming decades. To minimize damage to trees and property, a trained arborist should periodically inspect trees. Trees may need to be pruned or removed if they have spreading branches that are vulnerable to breaking, are towering over houses, driveways, and powerlines, are leaning, have obvious defects in their trunks, or have signs of sickness, such as many dead branches in their canopies. 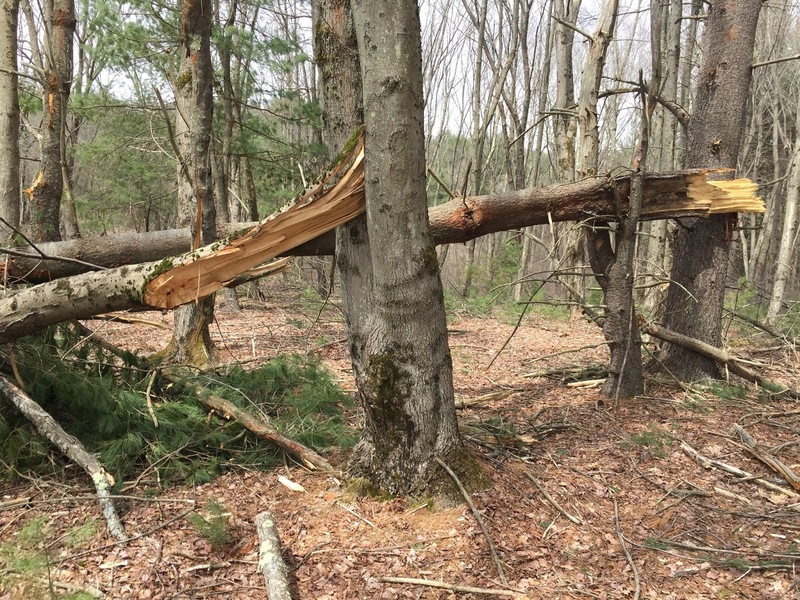 This type of preventative work will help protect trees in cites and around our homes, and reduce the costs of expensive cleanup if the trees fall or break during a storm. In a famous short story, Rip Van Winkle falls asleep in colonial New York and wakes up 20 years later to discover that the American Revolution has changed everything. In a recent article published in Ecology Letters, we report that a surprisingly large number of wildflower species display a similar phenomenon called prolonged dormancy, in which individual plants remain alive in the soil for one or more years, before reappearing above ground just like Rip Van Winkle. Some plants have even been recorded to remain dormant for ten years or more. A large proportion of the examples of dormancy are found in orchids. Orchids apparently survive underground for one or more years by obtaining nutrients from soil fungi. Pink lady’s slipper orchids in Massachusetts sometimes remain dormant in the ground for one or more years before re-emerging. These observations of dormancy are made during long-term studies of plant populations in which researchers monitor tagged and mapped individual plants. The results can inform conservation managers, who typically aim to protect rare plants and their habitats. Dormant plants represent special challenges to land managers if they are not seen for many years. The ability of some plants to successfully enter and emerge from dormancy may give them an advantage in surviving periods when there are harmful conditions, such as drought or large numbers of herbivores. This seems to be a bet-hedging strategy in which the disadvantage of missing a growing season by remaining dormant is less than the disadvantage of emerging from the ground in an unfavorably year. Our study demonstrates that wildflowers, just like Rip Van Winkle, sometimes need a good long sleep. This article has also been widely reported on in the popular press. For example, here is an article in NexusMedia.